It is LGBT+ History Month in February and The Sixth Form College, Solihull is marking this with a series of activities in College. The Sixth Form College, Solihull is committed to ensuring Equality and Diversity at the College is celebrated and this includes an active LGBT+ Society that meets regularly. 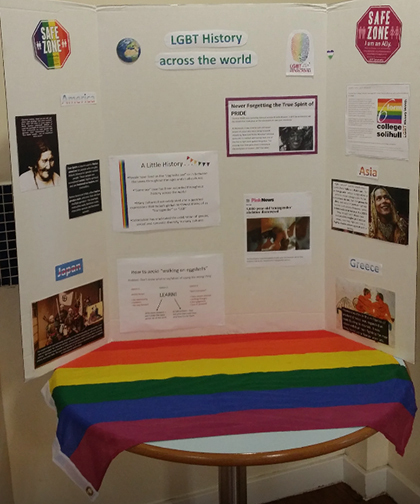 This group of students, supported by the Student Development Officers, are heavily involved in activities for marking LGBT+ History Month this February, including making and distributed badges to staff and students alike and making displays to be put up around College to raise awareness. A bake sale and a Film Festival is planned during the month to raise money and awareness as well. The College recently achieved the Investors in Diversity Stage 2 award from the National Centre for Diversity. Support for the LGBT+ Society is just one way that this award was achieved. The National Centre for Diversity also praised the College for its commitment to equality and diversity, highlighting how well embedded in the College Missions Statement (Aspire, Invest, Respect) it is.